Mugwort, when burned as an herb, has a deep penetrating effect. Mugwort has the ability to carry chemicals of other herbs to specific parts of the body. Moxawool is commonly made with mugwort combined with other herbs to treat a specific ailment. Moxibustion can be so intense that it can be felt deep in the bones. The effect can last several days. 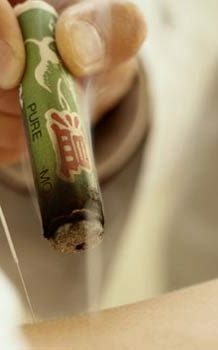 To properly use moxibustion a skilled healer must use it on acupoints or along meridians where Qi travels. There are two forms of moxibustion. With needles or just moxa alone. Moxawool can be placed on needles to increase the effect of the treatment. Moxibustion can be used alone to treat many conditions. It is a great substitute for acupuncture for those that are afraid of needles. Kids and the elderly love moxibustion. One of the most recognized form of moxibustion treatment is the ability to move the Qi in the body to rotate the baby’s head to the birth canal. The Chinese has been doing this for thousands of years. This form of treatment is painless and at the same time very comforting for the mother. This form of Moxibustion of treatment can prevent breeches.